An emblematic monument to world peace moored in Copenhagen’s Nordhavn harbour, the House of Peace is mobile – as a floating structure, the pavilion may travel the world, creating international awareness of our shared need for world peace. 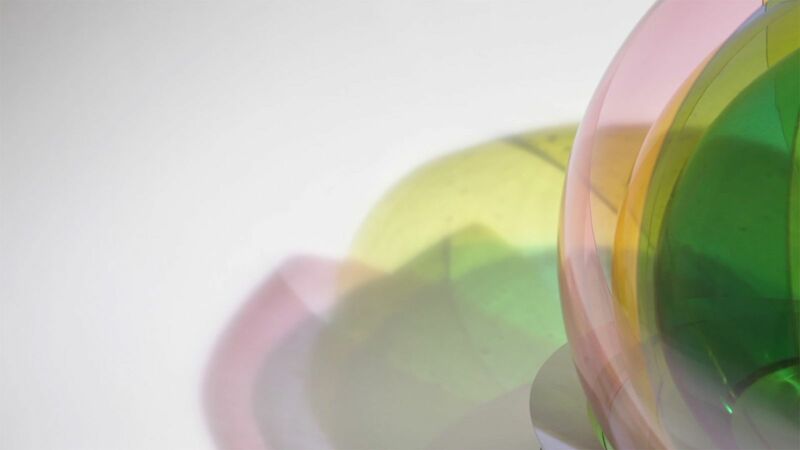 Six glass shells of three subtractive colours – cyan, magenta, and yellow – overlap as a spherical dome and combine to produce this variegated House of Peace. Through the combination of only three colours, countless hues and light intensities are created, shaping an open, colour-saturated interior. As the visitors move about, their eyes adjust to the colour surrounding them, so that when they move to another position and its corresponding colour, they perceive it in relation to the previous colour. Every colour perception is dependent on the experience that precedes it. The hues of the glass shells interact with the shades of the sky, the colour of the water, and the environments visible beyond the dome. Rather than supporting a single, focused, static viewpoint, the House of Peace encourages shifting, panoramic perspectives. Water covers seventy-one per cent of our planet; wherever the surface of water extends, the House of Peace can reach. As an enduring symbol of peace, it is recognisable wherever it is, standing out against the topography of the location. Through its global appeal, it creates international awareness of our shared need for world peace. The House of Peace is an unrealised project proposal that was developed by invitation for the House of Peace (HOPE) competition, won by Junya Ishigami and Svendborg Architects. Our competition model is part of the Architecture and Design collection at the Museum of Modern Art in San Francisco.